Old Town (Altstadt) and Aare Gorge will appeal to history buffs. Relax by the water at Strandbad Tiefenbrunnen and Seebad Katzensee. 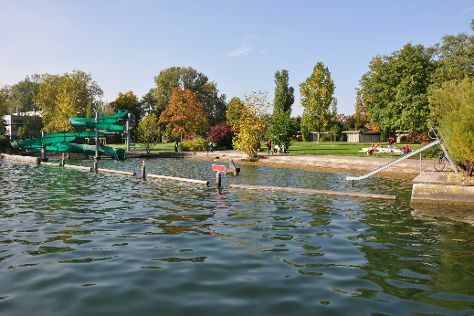 Explore Zurich's surroundings by going to Seebad Eich (in Eich) and Dying Lion of Lucerne Monument (in Lucerne). There's lots more to do: explore the different monuments and memorials at Friedhof Fluntern (Fluntern Cemetery), look for gifts at Confiserie Sprüngli AG, get a taste of the local shopping with Uhrenmuseum Beyer Zürich, and pause for some serene contemplation at Kirche Enge. To see reviews, more things to do, photos, and other tourist information, you can read our Zurich itinerary maker. London, UK to Zurich is an approximately 4.5-hour flight. You can also take a train; or drive. You'll lose 1 hour traveling from London to Zurich due to the time zone difference. In May, daytime highs in Zurich are 20°C, while nighttime lows are 10°C. Wrap up your sightseeing on the 11th (Thu) to allow time to travel to Nuremberg. Old Town and Albrecht-Dürer-Haus will appeal to history buffs. Get a sense of the local culture at Imperial Castle of Nuremberg and Würzburg Residence. Change things up with these side-trips from Nuremberg: Rothenburg (Town Walls, Kriminalmuseum, & more) and Marienburg Fortress (in Wurzburg). The adventure continues: get engrossed in the history at Germanisches Nationalmuseum, contemplate in the serene atmosphere at St. Lorenz Church, and steep yourself in history at Palace of Justice. To find maps, more things to do, reviews, and more tourist information, you can read our Nuremberg custom trip planner. Traveling by flight from Zurich to Nuremberg takes 2.5 hours. Alternatively, you can drive; or take a bus. Expect a daytime high around 22°C in May, and nighttime lows around 9°C. Wrap up your sightseeing on the 14th (Sun) to allow time to take a train to Munich. Visit Nymphenburg Palace (Schloss Nymphenburg) and Neuschwanstein Castle for their historical value. Satisfy your inner culture vulture at Deutsches Museum and Neue Pinakothek. Go for a jaunt from Munich to Diessen to see Strandbad St. Alban about 54 minutes away. There's still lots to do: explore the world behind art at Alte Pinakothek, admire the striking features of St. Peter's Church, see the interesting displays at Munich Residenz, and appreciate the extensive heritage of Haidhausen. For photos, maps, ratings, and tourist information, go to the Munich itinerary planner. You can take a train from Nuremberg to Munich in 1.5 hours. Alternatively, you can drive; or take a bus. In May, daytime highs in Munich are 21°C, while nighttime lows are 9°C. Wrap up your sightseeing on the 20th (Sat) to allow time to drive to Salzburg. Fortress Hohensalzburg and Mozarts Geburtshaus are good opportunities to explore the local culture. Hellbrunn Castle (Schloss Hellbrun) and Franziskanerkirche will appeal to history buffs. Explore Salzburg's surroundings by going to Hallstatt (Salzwelten Hallstatt & Hallstatt Viewing Platform). The adventure continues: browse the exhibits of Mozart-Wohnhaus, take in the spiritual surroundings of Salzburg Cathedral (Dom), sample the tasty concoctions at Bräustübl zu Mülln, and stop by Alte fürst-erzbischöfliche Hofapotheke. For maps, photos, reviews, and tourist information, go to the Salzburg travel itinerary planner. Traveling by car from Munich to Salzburg takes 1.5 hours. Alternatively, you can take a train; or take a bus. May in Salzburg sees daily highs of 22°C and lows of 10°C at night. Wrap up your sightseeing on the 25th (Thu) early enough to drive to Cesky Krumlov. Kick off your visit on the 26th (Fri): steep yourself in history at Latran houses, pause for some serene contemplation at Christi and Our Lady of Sorrows Church, steep yourself in history at Former cafe fink, explore the historical opulence of Cesky Krumlov Castle, then appreciate the extensive heritage of Historic Center of Cesky Krumlov, and finally pause for some serene contemplation at St. Jost Church. Get ready for a full day of sightseeing on the 27th (Sat): head outdoors with Outdoor Krumlov, then examine the collection at Museum Fotoatelier Seidel, and then admire the masterpieces at Egon Schiele Art Centrum. 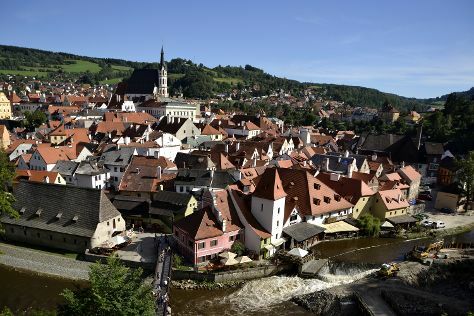 For traveler tips, more things to do, photos, and more tourist information, you can read our Cesky Krumlov trip generator. Getting from Salzburg to Cesky Krumlov by car takes about 2.5 hours. Other options: take a train; or take a bus. In May, plan for daily highs up to 22°C, and evening lows to 10°C. Cap off your sightseeing on the 27th (Sat) early enough to catch the train to Prague. Get a sense of the local culture at Prague Astronomical Clock and Old Town (Stare Mesto). Your inner history buff will appreciate Old Town Square and Prague Castle. And it doesn't end there: snap pictures at Charles Bridge, take an in-depth tour of Jewish Museum in Prague, tour the pleasant surroundings at Vrtbovská zahrada, and pause for some photo ops at Vyšehrad. To find reviews, traveler tips, other places to visit, and more tourist information, refer to the Prague sightseeing planner. You can take a train from Cesky Krumlov to Prague in 1.5 hours. Other options are to drive; or take a bus. Expect a daytime high around 20°C in May, and nighttime lows around 10°C. Cap off your sightseeing on the 2nd (Fri) early enough to go by car to Berlin. Deepen your sense of the past at sights like Charlottenburg Palace and East Side Gallery. Your cultural itinerary includes sights like Pergamonmuseum and Potsdamer Platz. Spend the 5th (Mon) exploring the collection at Museum Island. 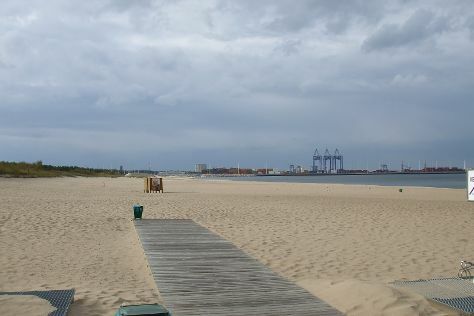 There's lots more to do: enjoy the sand and surf at Strandbad Tegeler See, appreciate the history behind Memorial to the Murdered Jews of Europe, admire the landmark architecture of Reichstag Building, and admire nature's wide array of creatures at Zoo Berlin. To see other places to visit, maps, ratings, and more tourist information, you can read our Berlin vacation builder. You can drive from Prague to Berlin in 3.5 hours. Other options are to fly; or take a train. In June in Berlin, expect temperatures between 26°C during the day and 14°C at night. Wrap up your sightseeing by early afternoon on the 8th (Thu) to allow time for travel to Budapest. Do some cultural sightseeing at Fisherman's Bastion and Liberty Statue. Deepen your sense of the past at sights like Heroes' Square and Vajdahunyad Castle (Vajdahunyadvar). And it doesn't end there: get a sense of history and politics at Residence Parliament, take in the spiritual surroundings of St. Stephen's Basilica (Szent Istvan Bazilika), examine the collection at House of Terror, and snap pictures at Chain Bridge (Szechenyi lanchid). To find where to stay, other places to visit, maps, and other tourist information, go to the Budapest travel planner. Getting from Berlin to Budapest by flight takes about 5 hours. Other options: drive; or take a train. While traveling from Berlin, expect somewhat warmer days and about the same nights in Budapest, ranging from highs of 30°C to lows of 15°C. Cap off your sightseeing on the 14th (Wed) early enough to go by car to Vienna. Popular historic sites such as St. Stephen's Cathedral and Belvedere Palace are in your itinerary. Satisfy your inner culture vulture at Schoenbrunn Palace and Historic Center of Vienna. The adventure continues: explore the world behind art at Kunsthistorisches Museum, examine the collection at Haus der Musik, tour the pleasant surroundings at Schönbrunn Zoo, and explore the galleries of Central Cemetery. To find more things to do, reviews, and tourist information, refer to the Vienna holiday planner. You can drive from Budapest to Vienna in 2.5 hours. Alternatively, you can take a train; or fly. In June in Vienna, expect temperatures between 28°C during the day and 16°C at night. Wrap up your sightseeing by early afternoon on the 21st (Wed) to allow time for travel to Krakow. Do some cultural sightseeing at Memorial and Museum Auschwitz-Birkenau and Wawel Royal Castle. Get some historical perspective at Main Market Square and Jewish District (Kazimierz). There's much more to do: take in the spiritual surroundings of Wawel Cathedral, steep yourself in history at The Barbican (Barbakan), appreciate the extensive heritage of Historic Old Town, and explore the fascinating underground world of Wieliczka Salt Mine. To see other places to visit, ratings, and more tourist information, use the Krakow trip itinerary builder. Getting from Vienna to Krakow by combination of flight and bus takes about 5 hours. Other options: drive; or take a train. June in Krakow sees daily highs of 26°C and lows of 13°C at night. Wrap up your sightseeing on the 27th (Tue) to allow time to travel to Gdansk. Relax by the water at Jelitkowo Beach and Sopot Beach. Get some historical perspective at Oliwa Cathedral and St. Nicholas Church (Kosciol Sw Mikolaja). Next up on the itinerary: kick back and relax at Stogi Beach, contemplate in the serene atmosphere at St. Mary's Church, take a stroll through Old Town, and examine the collection at Sala BHP. To find photos, ratings, maps, and tourist information, read Gdansk vacation trip planner. Getting from Krakow to Gdansk by flight takes about 3.5 hours. Other options: take a train; or drive. Traveling from Krakow in June, expect nights in Gdansk to be about the same, around 11°C, while days are slightly colder, around 22°C. Finish your sightseeing early on the 30th (Fri) so you can travel back home.